I have a bunch of junk in my trunk. The trunk of my car, people. Not my badonka donk! 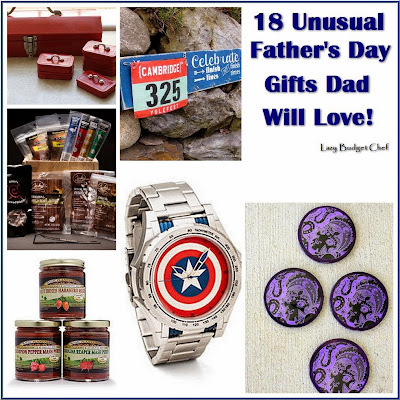 Although truthfully….oh never mind. The biggest mess maker is the stash of reusable shopping bags we keep in the car. They slosh out of the big shopping bag that is supposed to contain them and into everything else in the trunk. The last straw was when the mess hid a container of orange juice that popped out of a grocery bag and it sat in a hot car for several days. I still have nightmares about the stench that followed. So. Evil. Horrible. BAD. 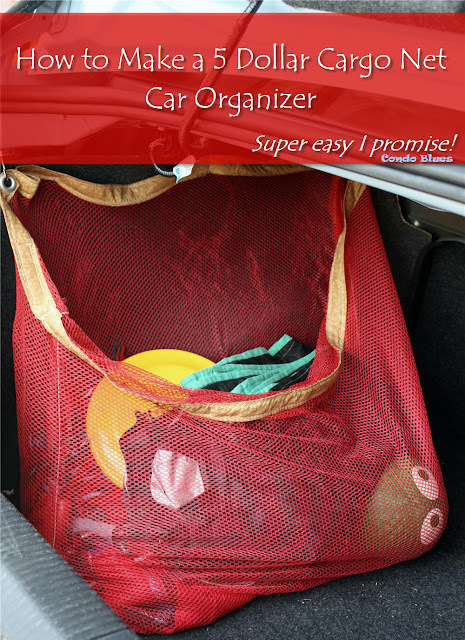 Most car organizers I found are not made for sedans, only SUVs. Besides we don’t want a shopping bag and stuff organizer that doesn’t allow us to fold the back seat down. This is mostly an issue during the summer when I’m hauling color guard equipment back and forth to practice. The flags don’t fit in the trunk unless I fold the seat down. Would you believe this is what my trunk looks like when it is neat? Sad. I know. I gave Lisa my idea to hang her shopping bag organizer on the side of the car trunk instead of the back. She came up with using laundry bags because the mesh is small enough to contain the most important thing in our car (besides snacks) my Frisbee and tennis ball for the dog park! 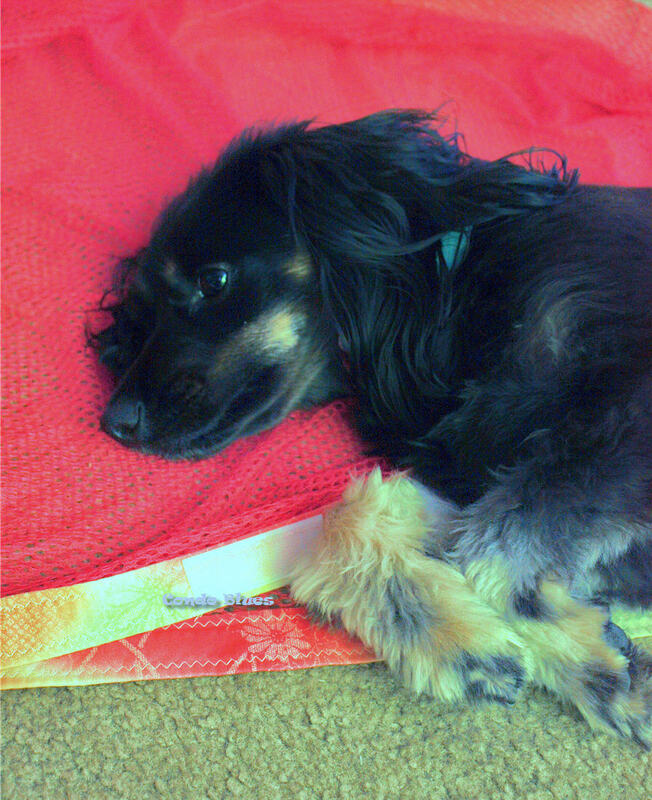 A canine project manger – Try to find one who doesn’t sleep on the job. I am not sleeping on the job! My eyes are open! 1. Remove the drawstring from the laundry bag. I cut the end off with a pair of scissors. 2. Use the scissors to cut a horizontal side open from the closed end of the bag to the open end of the bag. 3. Measure the circumference of the horizontal opening in the laundry bag and add 2 inches to that measurement for a seam allowance. 4. 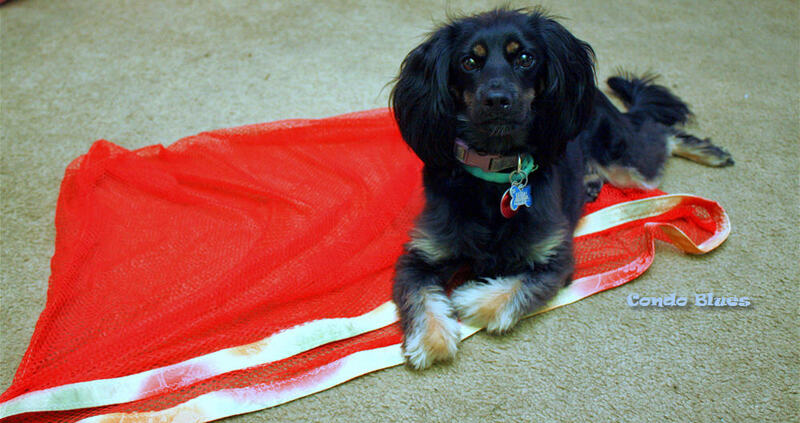 Use this measurement to measure and cut a piece of fabric and interfacing that is that long and 4 inches wide. 5. 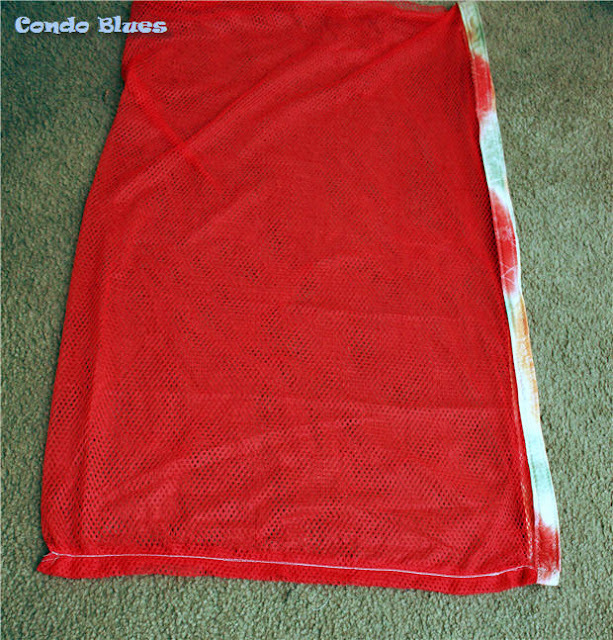 Fold the rough lengthwise edges of the fabric right side (the pretty part) to wrong side (the back of the fabric) in and iron them into place to make smooth edges to your banding. 6. Fold the banding wrong sides together and iron it into place. This will be the banding for the top of your cargo net trunk organizer. 7. 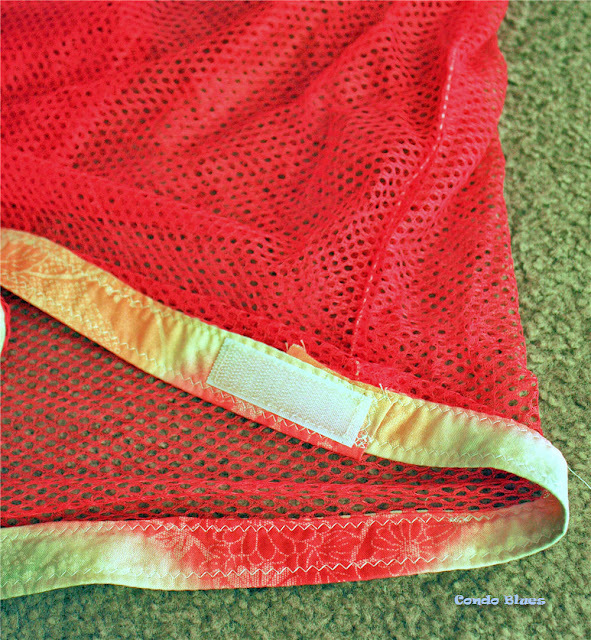 Use the straight pins to pin the banding around the top of the open mesh bag. Use the sewing machine to sew the top and the bottom of the band into place. I used a zig zag stitch because I forgot to reset my sewing machine back to a straight stitch after a previous project and I figured why not? You can use a straight stitch too. 8. Pin the raw open end of the laundry bag closed. Use the sewing machine to sew the bag closed. You should use a straight stitch to make this seam. 9. Set two grommets (also called eyelets) into the band of the bag using the grommet tool that comes with the grommets. Read my tutorial How to install grommets if your kit doe not come with clear instructions. 10. Sew a piece of the hook side of hook and loop tape to the back side of the fabric band. 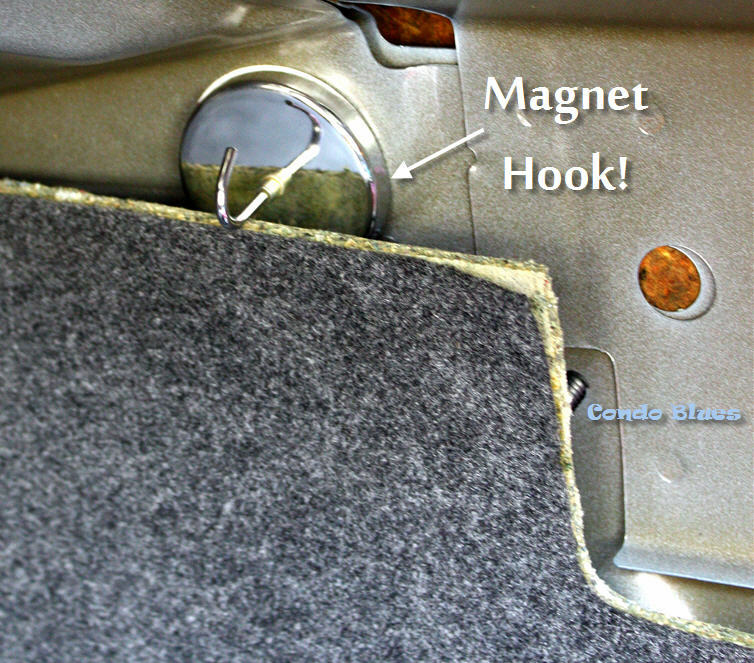 This will help keep your trunk organizer in place and against the carpeted wall of your car trunk. Warning: This will not be strong enough to keep the organizer full of stuff attached to the side of your car trunk. Guess how I know? That’s why we need Step 11. 11. 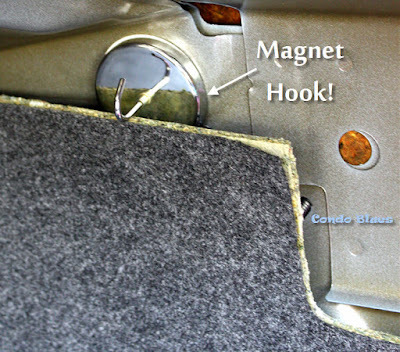 Attach the magnet hooks to the metal sides of your trunk, hang the cargo net up, and get that organize that junk in your trunk! 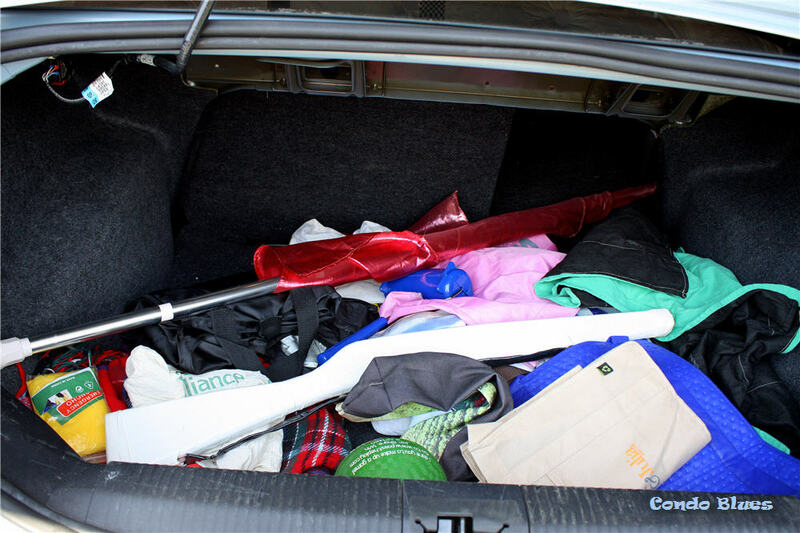 This is such an easy way to organize the stuff in our car and make sure it stays put! I made two net car organizers for each side of our trunk. One cargo net keeps our reusable shopping bags organized. The other cargo net keeps our picnic blanket, Frisbee and toys, and car seat covers from sliding all and hiding fetid orange juice containers for days on end. 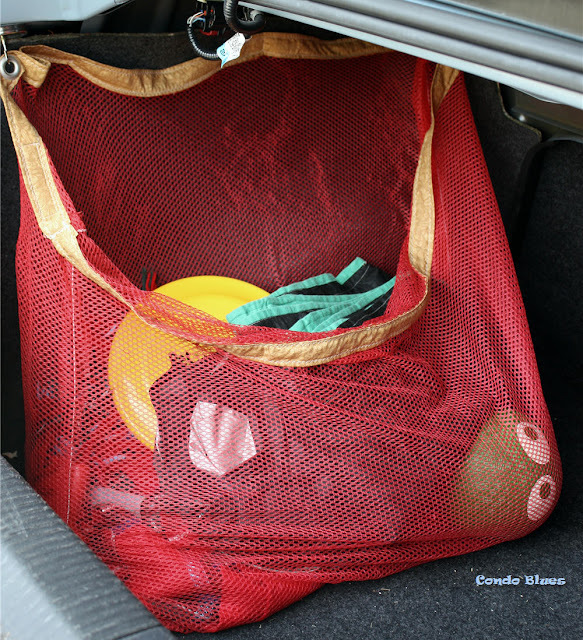 The net organizers are easy to remove if we need extra room in the trunk for a trip or when I buy something big at the home improvement store. How do you keep your car organized? How to Install Grommets (Eyelets) in Fabric the Easy Way! 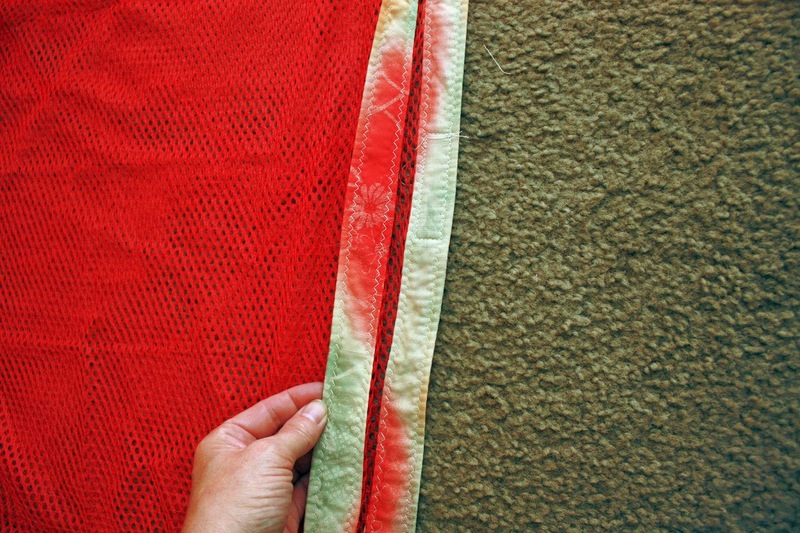 Crafty folks use grommets to make no sew shower curtains, yard flags, or any and all things hanging. I use grommets to make historical clothing, which are why my sewing button hole skills are nonexistent. You don’t need to know how to sew to install an eyelet. Do you want to learn? Of course you do! Keep reading my tutorial to learn how. 10 years of saving bottle tops later, I have hundreds of metal bottle caps to recycle into arts and crafts. I need new placemats and I like polka dots and penny tile. Do you know what looks like cheery polka dots and penny tile? Bottle caps! Pin this post to find my bottle cap tutorial after you collect all of the bottle tops you will need for this project! Let’s Make Painted Bottle Cap Tile Placemats! This post is sponsored by Green Sisterhood but the opinion is of my own. I seriously need to up my safe sunscreen game. My allergist gave me a new medication that makes me extremely photosensitive and I will be for most of the summer while the meds do their work. No big deal. Sunscreen is a way of life because I’m pale. I’m very familiar with the affects of UVB sun rays because you can see how they damage the top layer of your skin with the naked eye. For me UVB rays always cause a sunburn but for some of you hardier types the skin damage shows up as a sun tan. My doctor told me that is a good start but I have to be just as concerned about UVA rays too. Pin this info for later! Sandpaper lasts me quite awhile because I rarely have a project where I bust open a new sanding belt and sand all the grit off the belt before it is time to switch to a different grit during the project. Needing to change a still gritty sanding belt because it is clogged and gunked up with sawdust is a different matter. Why does it always happen when you’ve got just a little bit left to sand and you’re out of new sanding belts? Is it some DIY conspiracy I don’t know about? Possibly. Did you know you can clean sandpaper and prolong its life? Yep, you can! Cleaning a sanding belt is a cheap and easy thing to do. You might already have just what you need to do it too. When Star Wars came out, it was the first movie to have have major toy tie ins. Some of the toys were pretty good like the action figures. Some of the toys were not so great like the flashlight light sabers. And most of the time, the toy or character thing you wanted as a kid didn’t exist so you had to make it. Now all of those Star War maker kids are grown up. They share the Star Wars movies with their children and play with the cool new Star Wars toys they didn’t have when we were kids. But the coolest thing of all is those maker kid grew up and are still making epic Star Wars DIY projects. Some for their kids but mostly for themselves.